"The quiet generosity of those who possess almost nothing is a treasure in itself." "... our practice is not to fill ourselves with profound and precious teachings but to make ourselves fit to receive them, to become a strong, unbreakable vessel, even a diamond vessel." 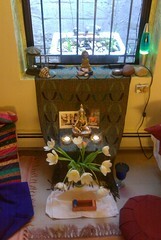 Here is the shrine for our practice day today, where we meditate, talk about our lives and the Dharma. The mitra sangha continues to grow, we had a mitra ceremony. Instead of tossing rice, we tossed lentles so I called her the lentle mitra. "To steady one's gaze on the finitude, contingency, and anguish of one's existence is not easy; it requires mindfulness and concentration." I'm reading it on a kindle, so no page reference. I'm thinking of developing a puja from some of his writings. I am enjoying this book. I like the intellectual tour de force. I've read his other books. I like his freedom of thought. He's more into confrontation than consolation. He dislikes other power. He does not discuss sangha much, mostly in terms of disagreement. When I met him he said the other star Buddhists he hangs out with are his sangha and the editorial staff at Tricycle, but I thought that wasn't really a satisfactory answer. He was quite gracious to meet with the FWBO NYC sangha. He gave us a signed book, which was very generous. (Give it back Andrew!) Nevertheless this was an awesome book in many ways, and I really like him as a writer. I highly recommend all his works, and this latest is another sterling book that I quite enjoyed. An excellent blend of the personal and thoughts, practice and experiences.